Not long after spending 136 days aboard the International Space Station (ISS), NASA astronaut Jack Fischer captivated hundreds of Kansas City students at Burns & McDonnell by sharing that they all have something in common: a passion for science, technology, engineering and math, or STEM. The astronautical engineer recounted highlights from some of his most inspiring achievements, including two spacewalks and more than 3,000 flights in 45 types of aircraft, to celebrate National Engineers Week, an effort to promote understanding and interest in engineering and technology professions. "When I was in elementary school, I told my parents I wanted to be an astronaut," says Fischer, who is a colonel in the U.S. Air Force. "I'm here with these students in Kansas City to show them your dreams are possible. They've already taken the first step — they're embracing STEM education. Now, we need to help them connect that path to a STEM career." A graduate of the U.S. Air Force Academy and the Massachusetts Institute Technology, Fischer's path to NASA included two combat tours in Southwest Asia. He served as a project pilot and tested weapons for the F-15, was a test pilot for the F-22 Raptor and served intelligence roles with the Pentagon. NASA selected Fischer to join the 20th NASA astronaut class in 2009. Following two years of intense training, he performed a variety of crew and mission support roles, as well as service in NASA's Exploration branch. In 2017, he launched aboard a Russian Soyuz rocket and served as flight engineer for Expeditions 51 and 52 aboard the ISS. During Fischer's more than four-month mission aboard the orbiting laboratory, he conducted hundreds of scientific experiments and two spacewalks. "It's pretty incredible to watch your little brother realize his dreams," says Paul Fischer, president, Regional Office Group, Burns & McDonnell. Paul, a civil engineer, invited his brother to Burns & McDonnell to illustrate one of hundreds of engineering roles that students can explore. "Our goal at Burns & McDonnell is to pass our passion forward, introduce as many students to STEM as possible, and then provide them with the tools, resources and inspiration along the way to embrace a STEM career," Paul says. 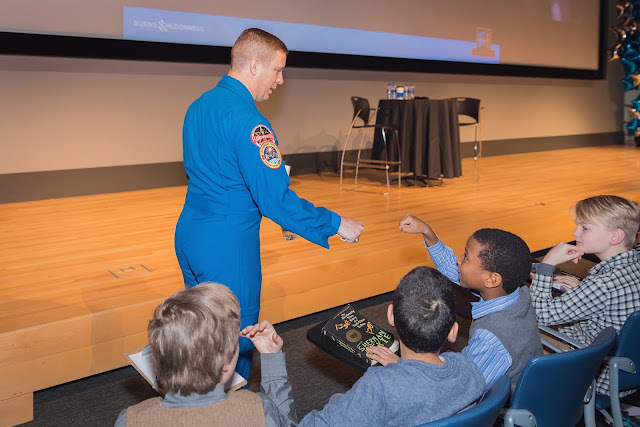 "Seeing the looks of excitement and wonder on the kids' faces as they listened to my brother's adventures today, I'd say, 'Mission accomplished.'"